Have you ever heard about some of the strangest superstitions existed? Even though superstitions vary from one culture to another all over the world, but we cannot defy the fact that they do exist and follow us anywhere. For most of history, superstitions have played a huge role in shaping the cultures and societies. Superstitions usually come with background stories that are believed by people in the particular area. Some of those include old wives tales, urban legends, and even horror stories. There will always be a superstitious aspect living inside individual, irrational as they may be. Russia is known as the largest country in the entire world and as its consequence, has a long and colored history. Being Russian sure has a lot to do with superstitious nature. They are raised to watch out for a lot of superstitious stuff. And by a lot, I mean a lot. Those superstitions are a part of their everyday lives and by following those unwritten rules, they believe they have warded off bad luck for years and years. Some people do love the seemingly random nature of superstitions and I myself genuinely love the ones I grew up with. Now, without further ado, I am going to share 8 creepiest Russian superstitions you will not believe with you here. Keep on reading! Actually, bad luck from a broken mirror is a mainstream superstition around the world’ e.g. in Germany, it means seven years of bad luck. In Russia, breaking a mirror is a bad sign because it means that somebody among the people who are pretty close to you will die. Then, thing will get even worse if you look at the broken mirror. Why? Because it means that you are going to die very soon or else, have a serious disease. According to the history, when you break a mirror, you also break the connection with the divine. Such act tears the soul from your body and leaves it adrift. So, what can you do when you just broke a mirror? You can say a prayer over the breakage and grind the pieces into dust so that no reflections can be seen. Knives, clocks, and scarves are not considered the best presents for a Russian. Because knives are an omen of enemies, clocks an omen of farewell, and scarves an omen of tears. Even if you are prepared to give a Russian girl a very expensive scarf as a present, she would more likely prefer to buy it herself in order to save herself the tears. If you do nevertheless give a Russian one of those things, then do not be surprised if they give you a small coin in return. This is to create the illusion of buying the item, so that they are safe from the bad luck. You must definitely take the coin, even if it surprises you that they are trying to pay you for an expensive gift with a small change. Birds landing anywhere near your windowsill and/or tapping on your window is basically another omen of death and illness. Thus, if you spot any bird near on your windowsill, you should chase them away immediately. Do not let them forebode you death and illness. Russians believe that whistling indoors can cause financial losses and poverty. So, when you pay a visit to Russian homes, avoid whistling as the hosts will think you are attempting to put an evil spell on them. There are many reasons why this superstition appeared in Russia. Some say, their ancestors believed that whistling is the language of evil spirits and so by whistling they are calling them and inviting them to their houses. Some other say, whistling was a magical way to call the wind and if they whistle in the house, the wind will blow everything away, including the money. Black cats are believed to be connected to mysterious and dark things. It is believed that if a black cat runs across your way, you are going to have bad luck that day. To avoid the potential bad luck, it is said that you should walk backwards away from the black cat. If you are visiting a Russian girl or going on a date, make sure that your bouquet has an odd number of flowers. Why? It is because Russians bring even-numbered flowers only to cemeteries. It becomes a symbol of grief. If you insist on giving flowers in even numbers to the Russian girl, you will put her in a bad mood. Read more informations about even numbers in Russia here (The Meaning of Odd Numbers in Russian Culture) and here (Even Numbers and Russian Culture: The Do’s and Don’ts). A Russian superstition holds that spilling salt is an evil omen. It will lead to an argument between family members. So, watch your elbows when you are eating. In case you wonder, this superstition came from when the salt was extremely expensive in Russia. So, if someone spilled it, a quarrel would likely happen. You can ward off the bad luck by throwing three pinches of salt over your left shoulder−the place where they believe an evil spirit resides−immediately. In Russia, it is not just a matter of table manner or a nasty habit. It is one of famous Russian superstitions. Even all the little kids in Russia know about it. Apparently, if you lick the food off of the knife, you will likely become an angry person. And the more you lick, the angrier you will become. Actually, not all Russians are superstition fanatics. But, many follow traditional beliefs in their daily routines. You do not need to follow them strictly, but I hope this article would help you be prepared for any surprises. 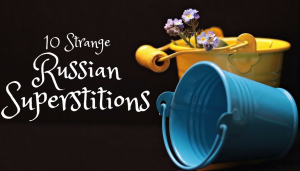 So, which of those creepiest Russian superstitions you find most unbelievable? Let me know.